This is the third album (and second for Wicked Cool) for the all-female band from Oslo, Norway. They play a mix of powerpop and garage rock with lots of girl-group harmonizing. 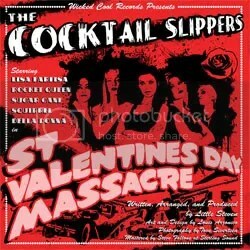 Some of the artists they remind me of are the girls in the B-52’s, Chrissie Hynde of the Pretenders, and the Pipettes – but the Cocktail Slippers are unlike the Pipettes because they play their own music, and have cooler names (Sugar Cane, Modesty Blaze, Rocket Queen, Squirrel and Bella Donna). Little Steven wrote the title track for the album and also “Heard You Got A Thing For Me” and contributed some bongo playing; this band is also further proof that he picks the coolest bands on the planet for his Wicked Cool label. Awesome! This entry was posted on April 24, 2009 at 12:00 pm and filed under TheSlacker. You can follow any responses to this entry through the RSS feed.